The text and effect of this card allude to overclocking, in which the performance of a machine could be increased (usually computer hardware) at the risk of instability or outright hardware failure, reflected in its effect. 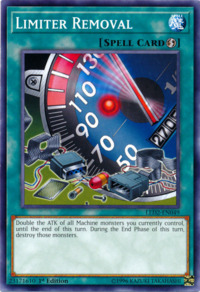 The odometer on this cards artwork appears to be a broken version of Speed Spell - Acceleration Limiter. The odometer features the number 2705, possibly implying that the effect was used on a monster with 1350 ATK. Possible candidates are Kinetic Soldier and Disk Magician. Ironically, in spite of this card's name, this card is currently Semi-Limited in the Advanced Format. Both have an effect that doubles a Machine-Type monster's ATK (albeit Sonic Boom is more specific with this) and destroys the affected monsters during the End Phase. Both card's artworks depicts references of high speed (this card's shows a maxed out speedometer and Sonic Boom shows a titular sonic boom, which is a loud sound associated with the distortion of air wrought by an object that travels at a speed that breaks the sound barrier). When this effect resolves, this effect is applied to all face-up Machine-Type monsters in your Monster Zone. If this card is activated during the Damage Step, it can be activated from the start of the Damage Step until before damage calculation. Applying "During the End Phase of this turn, destroy those monsters." does not start a Chain Link. The effect of "Limiter Removal" is applied to all face-up Machine-Type monsters in your Monster Zone when the effect resolves. The total ATK of the monster is doubled, including any ATK increases/decreases from other effects. When a monster's ATK is doubled with "Limiter Removal" and another "Limiter Removal" is activated, the ATK created by the first "Limiter Removal" is doubled by the second "Limiter Removal". Machine-Type monsters Summoned after "Limiter Removal" resolves are unaffected and are not destroyed during the End Phase. If an affected monster is flipped face-down or becomes an Equip Card, it is not destroyed in the End Phase. 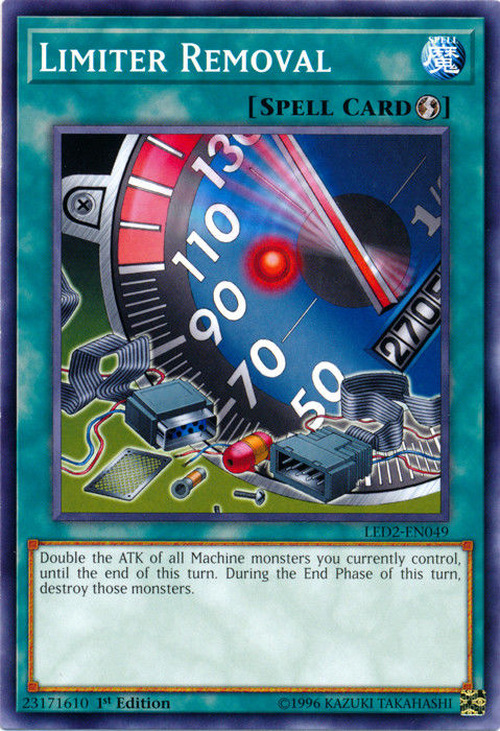 If a Machine-Type monster's ATK is doubled with "Limiter Removal" and afterwards its Monster Type is changed, it is still destroyed in the End Phase. Book of Moon:" If you use "Book of Moon" on a monster that had its ATK doubled with "Limiter Removal", the monster is not destroyed at the end of the turn. Curse of Aging:" The effect of "Curse of Aging" is not applied to face-down monsters. It is only applied to the face-up monsters on the field when "Curse of Aging" resolves. It is not applied to monsters Summoned after "Curse of Aging" resolves, either. (Similar to "Limiter Removal"). This means that even if face-down monsters are flipped face-up in the same turn, their ATK or DEF are not changed by the effect of "Curse of Aging", even if they were on the field (face-down) when "Curse of Aging" resolved. Cyber Shadow Gardna:" If you use "Limiter Removal" on your "Cyber Shadow Gardna", both effects (destroy it because of "Limiter Removal", and change it back into a Trap Card by its own effect) happen during the End Phase in the order of the controller's preference. Heavy Mech Support Platform:" If you have a monster, "X-Head Cannon" for example, equipped with "Heavy Mech Support Platform", and you activate "Limiter Removal", the ATK will becomes (1800 + 500) x 2 = 4600. Also, the "Heavy Mech Support Platform" will be destroyed instead of the "X-Head Cannon" during the End Phase (by the effect of "Limiter Removal") and "X-Head Cannon's" ATK will no longer be doubled. Interdimensional Matter Transporter:" When "Karate Man", or a monster affected by "Limiter Removal", is removed from play with "Interdimensional Matter Transporter", it is not destroyed that turn because the effect of "Karate Man"/"Limiter Removal" is reset. Mage Power:" If you control "Cannon Soldier" equipped with "Mage Power", and you activate "Limiter Removal", then the ATK of "Cannon Soldier" is (1400 + 500 + 500) x 2 = 4800. Metallizing Parasite - Lunatite:" If you equip "Metallizing Parasite - Lunatite" to a monster that has been affected by "Limiter Removal", the monster is still destroyed during the End Phase by "Limiter Removal's" effect. My Body as a Shield:" "My Body as a Shield" can only be used against effects that will destroy monsters at that time Also, you cannot use "My Body as a Shield" against cards whose effects will not destroy a monster right away, so you cannot use "My Body as a Shield" against"Limiter Removal"
Prime Material Dragon: you cannot use "Prime Material Dragon's" effect against cards whose effects will not destroy a monster right away, so you cannot use "Prime Material Dragon" against "Limiter Removal"
Shrink: If "Shrink" affects a monster whose ATK is doubled by "Limiter Removal", that monster's ATK will become half of its original (printed) ATK. Trap Monster: If you change “Embodiment of Apophis” to Machine-Type and use “Limiter Removal”, then “Jinzo” is Summoned later that turn and “Embodiment of Apophis” switches back to a Trap Card, “Embodiment of Apophis” is not destroyed in the End Phase by “Limiter Removal”. Union Monster: If a Union Monster turns into an Equip Spell Card, or reverts back into a monster, effects are reset. If I use "Limiter Removal" on a Union Monster, and equip it, it is not destroyed at the end of the turn, and if I turn it back into a monster its ATK is no longer doubled. Weapon Change: If you use "Weapon Change"Gear Golem" into a 2200/800 monster, then use "Limiter Removal" to make it 4400/800, then destroy "Weapon Change"Gear Golem" is 800/4400. Y-Dragon Head / Z-Metal Tank: If "Y-Dragon Head's" ATK is doubled with "Limiter Removal", and then "Y-Dragon Head" is equipped to "X-Head Cannon", "Y-Dragon Head" is not destroyed at the end of the turn. If a Machine-Type Fusion Monster has its ATK doubled, because it was Fusion Summoned with "Power Bond", and "Limiter Removal" is then activated, the monster's total ATK (doubled by "Power Bond") is doubled again by "Limiter Removal". If you control a Machine-Type monster with its original ATK doubled by "Megamorph" and you activate "Limiter Removal", the original ATK being doubled by "Megamorph" is again doubled by "Limiter Removal". If the "Megamorph" is later removed or if there is a change in Life Points, the ATK value created by "Limiter Removal" remains. But if a monster's ATK has been doubled by "Limiter Removal" and then it is equipped with "Megamorph", then the ATK value created by "Limiter Removal" disappears and only "Megamorph's" effect applies. Additions/Subtractions of other Equip Spell Cards are still re-applied.